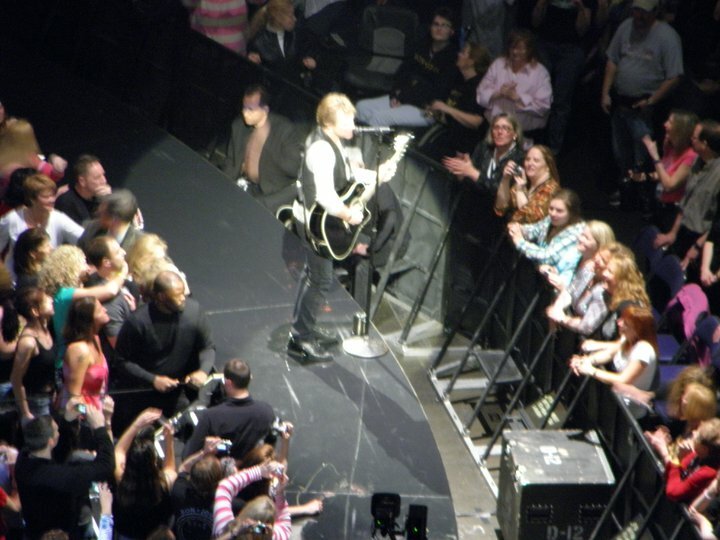 Re-Blog: Bon Jovi Was HERE!! 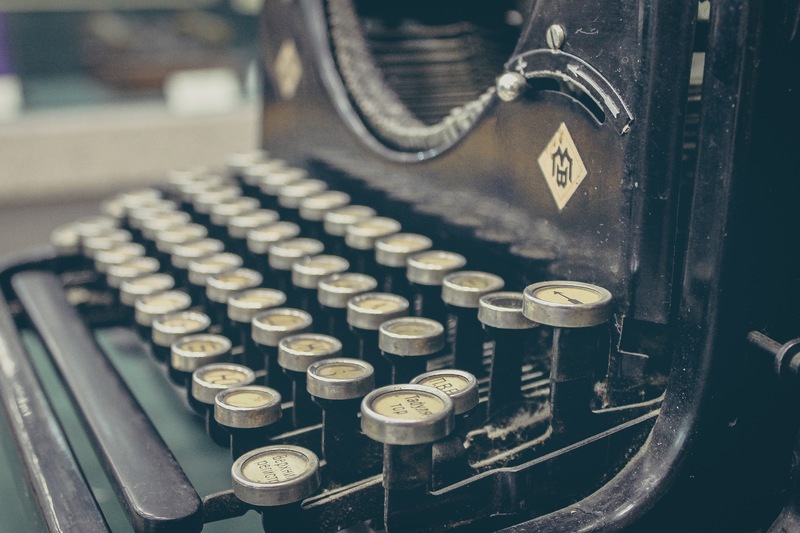 Another re-blog….but you’ll see why! Have a great day everyone! Apparently some how the boys from Jersey…the guys who used to have all that hair…the band that has wowed stadiums filled with thousands of people…CAME TO MY HOUSE! I told you they were stalking me! They came over around 1AM Wednesday night and started playing in my front yard. They brought acoustic guitars, didn’t have a piano or drum kit so they used some empty planters and rocks from my garden. The lovely old widower across the street did not take to those noisy kids “banging around” my house and called the police. When the police arrived I tried to explain that “BON JOVI is just STALKING ME on the radio,” but all they heard over the guitars and planters was the stalking part. So they were arrested on the spot for disturbing the peace, stalking and inappropriate use of gardening materials. They tried to keep it very hush hush but I’m sure the press will catch wind of it soon. I did manage to get autographs…they aren’t very good since they were already in handcuffs. But I’ve got my fingers crossed that I will get copies of the mug shots. AND, to top it all off…wait for it…that’s right April Fools. This is an April Fools joke. No offense is intended. At no point was anyone in Bon Jovi, or anyone associated with the band or the organization, at my house or annoying my neighbors. Happy April Fools Day! 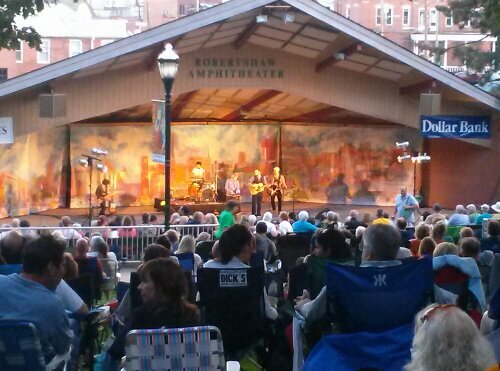 Every week across America there are free concerts during the summer. Sometimes it’s a community band. Sometimes it’s a symphony. Sometimes it’s rock. Or country. Or reggae. No matter what the style, it’s a chance for people to get together, enjoy the summer weather and some great sounds. 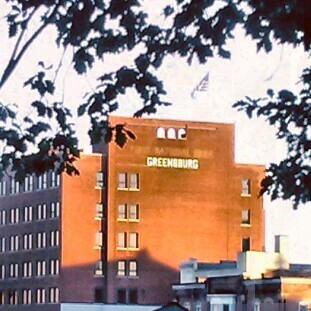 My family just spent a beautiful Friday night in Greensburg at Summer Sounds. It’s a great summer-long event that brings a wide variety of music to an amazing location for people to enjoy for free. As I sat there in the fading twilight watching kids dance, lightning bugs flash, that guy pulling his cat around in a wagon and listening to the amazing Guggenheim Grotto (seriously a great band, check them out!) I felt really blessed. Here I was enjoying a great show, in a great place, spending time with my family in a family friendly environment for free. And free is awesome for a freelancer looking for full time while trying to support a family. Guggenheim Grotto performing in Greensburg, PA July 26, 2013. But this is only on example. How many communities have events like this? A chance for friends to get together and enjoy music for free is an amazing gift. Exposing kids to different kinds of music and giving them the freedom to dance and play. How awesome is that? So go out and enjoy these events! Take advantage of them. I promise you the musicians love having an audience to play for. 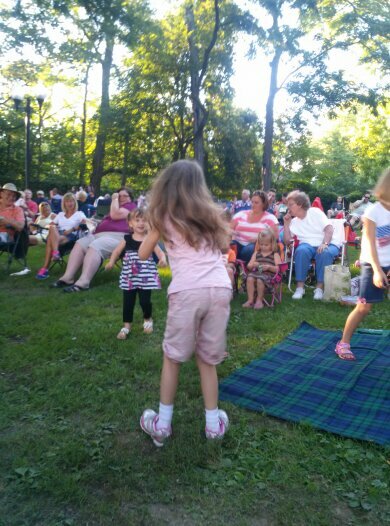 If you know of a great free concert in your community and want to share, I am all for it. The only way to make sure these kind of activities continue is by supporting them, so share your link below! Over the next week or so I’m going to relate several stories and observations from a concert I recently attended. At least one of them goes with my video/technology interest, the other are based more in the realm of I don’t get out much. This is where our first post comes from. The name of the band really isn’t important right now…ok it was Bon Jovi. And, if you must know, I have a bit of a history with them. But what I saw at the concert could have really happened to anyone…. The guy sat down a few rows of head of me on the stairs. That wouldn’t have been a big deal if that hadn’t been the point in the show where the move to the very front of the stage. My view was blocked by the guy folding t-shirts and stuffing them in his jacket. I completely missed one song because I was distracted by a guy who was so full of himself that he felt he could sell t-shirts out of his jacket during a concert and was taking the time to fold his merchandise from the stands while he kept a close eye out for security. Talk about chutzpah! I mean it’s not like the guy was selling knock-offs or stolen shirts outside in a parking lot or something. He was inside the venue. In the stands. Folding the shirts in front of people who had just spent a decent amount of money at the merchandise stands! Either he’s got really big ones – or a very small IQ. Eventually I got fed up and went down to the merchandise stand just behind where we were sitting. I asked them if they authorized guys to sell shirts out of their jackets. They just looked at me for a moment, then asked me what I said. I asked if they sent people into the stands to sell shirts out of their jackets, cause there was a guy a couple of rows ahead of me doing it. Panic crossed their faces and they asked me to talked to the security person for my section. So I did, and then walked down the hall. When I headed back to my seat I saw two men with SECURITY across their jackets go running past. I figured I knew why. I admit it I tried to tell them who it was and they walked past him. So I went to my seat. One of them was standing beside me, so I tapped him on the shoulder and pointed. He went down and talked to the guy – who said he couldn’t talk because he was on his cell phone. That’s right folks…the guy was at a concert, talking on his cell phone! Anyone ever try that and succeed? Well, apparently it worked for the security guy who walked away from Shirt-Man to talk to the other security folks. No sooner had he turned his back and Shirt-Man was up on his feet and running down the stairs. By the time security turned back around the guy was probably on the Metro and half-way to Maryland. Now, I know I don’t get out much. I admit that. I’ve got a job and kids and such, and don’t get to go to concerts very often. And maybe I’m a Goodie-Goodie who should have kept my mouth shut. But I really couldn’t believe what I was seeing. All I can say is this. If you are going to stuff shirts in your jacket to sell during the concert inside the venue…just make sure you don’t fold them in front of a really short chick who doesn’t get out much! Bon Jovi is After Me! It all started a couple of years ago when they released Lost Highway. I first noticed it in the car on the way home from work. I would hear a Bon Jovi song every night, no matter what time I left the office. It made no difference if I worked late or left early, I would hear one of the band’s songs come on usually along a two miles stretch of highway. Pretty soon every time I got in the car a Bon Jovi song was coming on or going off. If I changed the channel – there they would be again. I started to make jokes about it to my husband and my friends. My husband thought I was nuts…until that fateful weekend when we were running errands. You guessed it, every time we turned on the car there they were…change channels and the next song on…Bon Jovi. My husband started to admit that it was a little strange. Then it moved inside. I would flip through the TV channel and there they were on Behind the Music, or on some special. There were biographies, and network news magazines interviewing Jon. Richie was going through some personal issues and it was on every channel. Even obscure movies Jon acted in were playing regularly. It was crazy. Bon Jovi was everywhere. Even my preschooler was walking around singing “Shot Through the Heart”! I will admit, I became slightly obsessed with them…but only because I couldn’t get away from them! I adopted a philosophy of if you can’t beat ’em, join ’em (not that I would actually join them, unless they need a former flute player). I watched the shows, my husband bought me the album. I went to YouTube and watched the videos. Jon, Richie, David and Tico began to feel like an old friends. Always there (get it….always…get it?) when I got in the car at the end of a long day. Slowly they began to pull back. I began to think they found me less interesting. Or they were making a new album. Either way the boys from Jersey weren’t there for me (they swore those 5 words to me, didn’t they?). I faced the realization with a mixture of relief and sadness. I finally wouldn’t be hearing and seeing them 20 times a day, but they weren’t there singing to me every time I turned on the radio. Now they are on tour with the new album, with their greatest hits and they sneaked up on me again. They’re on the radio in the morning. Jon and Richie keep popping up in a local news promo. I’m glad to see them back, but I wonder how far they will take it this time? Where will they sneak up on me next? In the car, on TV, on Facebook or Twitter….be careful people. Runaway (get it?) 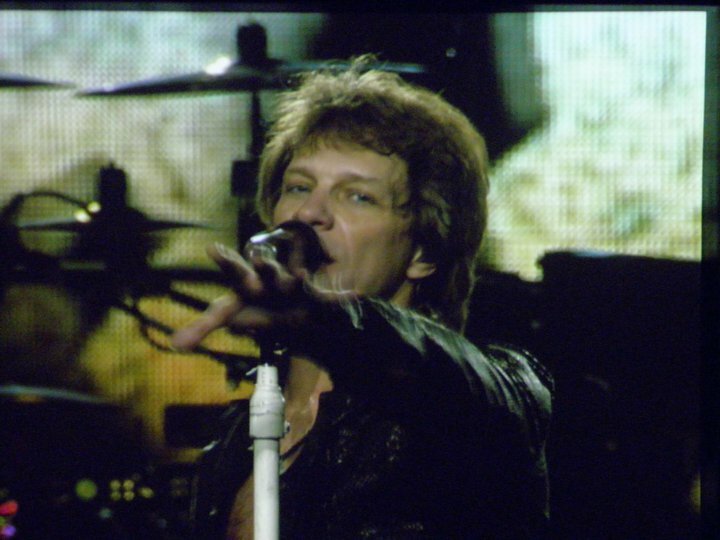 Bon Jovi could be coming for you next! I Saw Bon Jovi and Fell in Love with His Monitors! That isn’t some sort of euphemism, it’s a statement of fact. I recently saw a guilty pleasure in concert – Bon Jovi (no comments about musical taste please). We had tickets that were basically stage right which was the perfect angle to see what was happening behind the stage and check out the video monitors. Now, I realize that most people go to a concert with the sole purpose to listen to music and see a show. I want to do that but I have a habit of getting distracted by the technology. I’ve been known to watch spotlight operators, keep tabs on the folks running show production from the floor, and scrutinize how the stage lighting/sound/monitors all work together. I have to say that while the stage and lighting were nice, these monitors were amazing! I was so enthralled with them my husband had to keep reminding me to watch the band. Jon Bon Jovi gets a lift from robotic monitors. I am not the first person impressed. I actually saw a few articles, including this one, about these monitors. They were highlighted by the lighting and sound industries. The folks who developed the stage used the Venetian monitors developed for the previous tour and teamed them with five new monitors sitting on robotic arms that move and groove throughout the show. 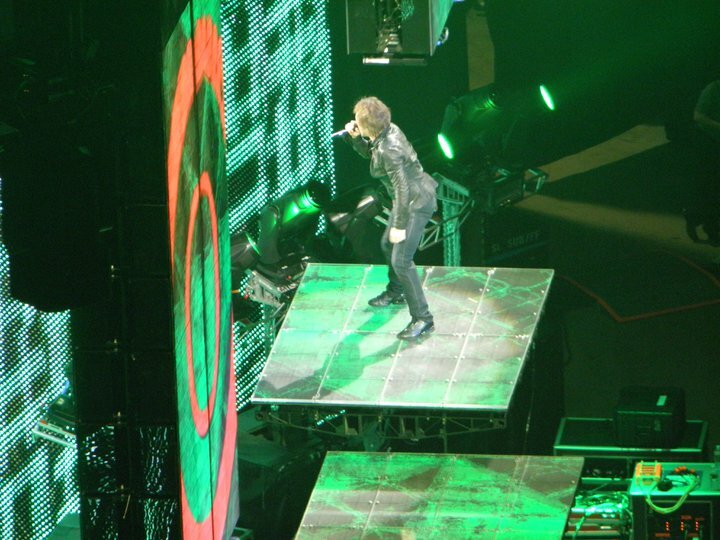 At one point the monitors turn into steps and stage as Jon Bon Jovi uses them to share the love with those behind the stage. The monitors light up and project as he walks across them. Combined with the larger monitors behind the stage, and the high def Venetian monitors, it’s an unbelievable sight. If you saw my earlier post, I admit that I don’t get out much. I don’t go to every concert out there, but I’ve been to some pretty good one…Van Halen, Sir Paul McCarteny, The Police, Meatloaf, Weird Al…and others. My first concert was the Beach Boys (I was a kid, and they most definitely were not). I may not be a concert regular, but I’ve got a few reference points to use for analysis. I think about the other concerts I’ve been to and I’m amazed at how far the technology has come. I remember back to hand-held cameras showing grainy images on much smaller screens. They were far from the clear crisp huge monitors all over the stage. Back then the screens were to help people see the stage better, they weren’t an important part of the show. That’s not to say flying monitors that doubled as a curtain and video stairs overpowered the show. They did exactly what they should do, enhance the show and increase the production values. I’m sure that there were few people at the show as fascinated by the monitors as I was. I’m just a geek that way. To paraphrase one of my favorite geeks. It’s pretty cool living in the future.